I can build your website so that it “scales” from desktop and laptop display, all the way down to tablet and mobile phone displays. The way I do this is by using a web technology called “Responsive Design”. Basically, that means your website “Responds” to the width of the display that is viewing it. This means your content will look great on any device… no zooming or “pinching” to read it. Your content, font size, and photos will be effectively scaled to fit any display. 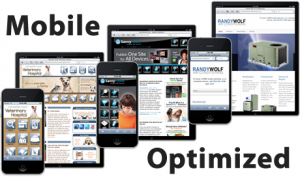 Contact me today for a FREE consultation about a Mobile Optimized Website for your business!